It is really hard for a business admin to "clean up" the published notebook list in an Evernote Business Account. You can see if there are zero users joined to a notebook, but you can't tell if there are notes in that notebook or not...even when you click on the notebook to get additional information about it. And, when you go to delete a notebook, it warns you that any data in that notebook will be removed from the account, but you aren't notified if there are notes in that notebook or not. I work with several business admins who have a series of "extra" notebooks that are in their account that were created either prior to them putting a thought out system/naming convention in place, or they have evolved their overall workflows and they want to clean out the published notebooks that are no longer relevant to their workflows. The amount of extra notebooks is amplified by the fact that they can't rename published notebooks for the business. Having a quick reference to the amount of notes in the the Notebook manager view would help admins to quickly delete notebooks with no notes in them. It would also be really helpful if there was some kind of link to the notes in a notebook from the delete dialogue box where the admin could quickly see the notes in that notebook so they could determine if the notes can be deleted, or moved before the notebook is deleted. I would really like work done around the admin of notebooks. 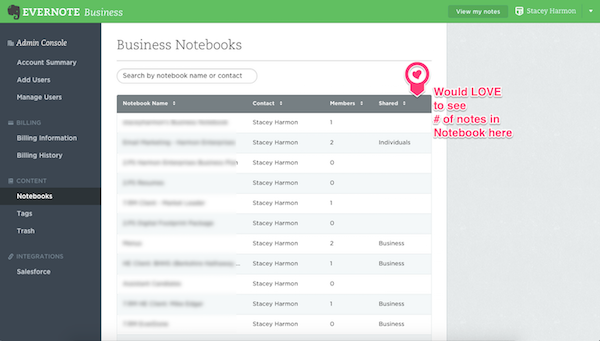 In addition to your great suggestion Stacey, I would like to see a table showing who has joined which notebooks, and what access they have (invite, edit, view). I'm currently creating one of these manually, with 200+ notebooks and 12 users. It is a crazy cumbersome task, but necessary to sort out why certain users aren't finding notes (the answer is because they have not joined the notebook which the note is in). I'm hoping the new invitation to beta test will bring some focus on administering these large multi user Evernote accounts. While I was wandering around today, I discovered that Dropbox Business has this for their admins. Someone heard me, but not the ones I need to have this in Evernote Business. I'm currently spitting a huge Evernote Business account into two, due to change in management. This type of report would be incredibly handy right now.